Are you experienced Master, Chief Engineer, Watchkeeping Officer, DP Officer, Watchkeeping Engineer, A/B, O/S or Cook? Do you want to go offshore and gain experince at offshore vessels? We hire maritime professionalists for the maritime industry with focus on the offshore market. We are cooperating with European Owners operating ships in the North Sea, Irish Sea and Baltic Sea. 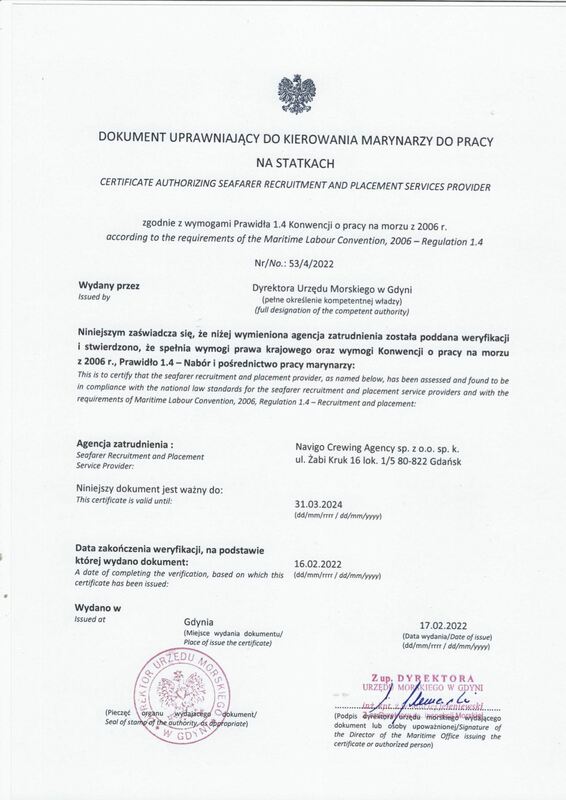 Navigo Crewing Agency is compling with Standard A 1.4 of Maritime Labour Convention 2006. Navigo offers job placement services for the Owners looking for qualified marine personnel to work at their ships. Employment service is free of charge to the Seafarer. For Polish sailors the company offers health & life insurance for sailor and his family. Salary paid every month (on and off board). Wpis podmiotu do rejestru podmiotów prowadzących agencje zatrudnienia nr 11552 z dn. 07-01-2015 r. dokonany przez Urząd Marszałkowski Województwa Pomorskiego. Personal data will be processed according to Polish Act of 10/05/2018 on the protection of personal data (Dz. U. of 2018, item 1000) and of EU Regulation 2016/679 of the European Parliament and of the EU Council of 27 April 2016 on the protection of individuals with regard to the processing of personal data and on the free movement of such data (referred to as General Data Protection Regulation, GDPR). For detailed information on how we will process your data please refer to the following link. Office working hours: 09:00 - 15:00 CET. Employment agency registered under no. 11552 on the day of 07/01/2015 r. by Office of the Marshal of Pomorskie Voivodeship in Gdańsk, Poland.